We had a lovely trip to Tuscany earlier on this year, during which time we spent a day with Bruna teaching us to cook some of the local dishes. Alex fell in love with the Pici, but I thought the fresh cantucci were just great . This recipe is my special Christmas version – if you want something more traditional, replace the pistachios with more almonds, the orange with lemon zest and omit the chocolate. 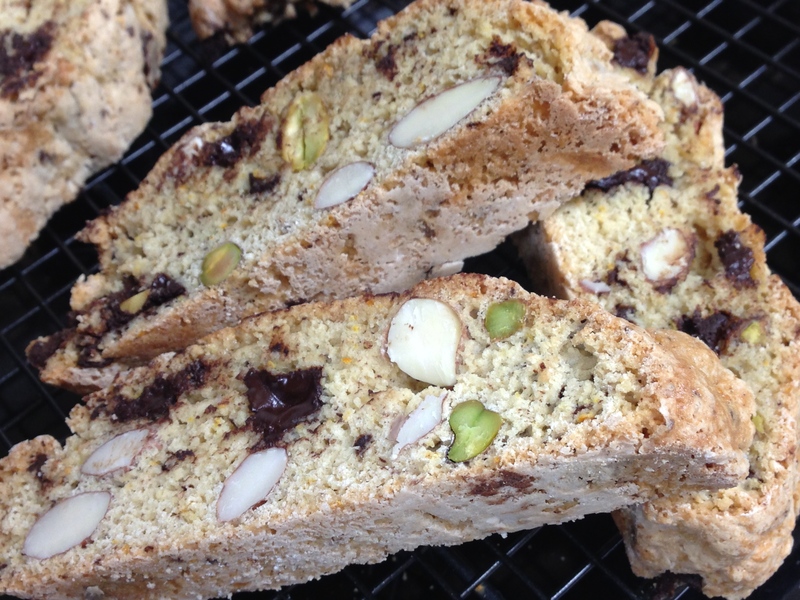 Cantucci are are a great Tuscan biscotti (‘twice baked’), traditionally served with a glass of Vin Santo in which to dunk them. They work equally well with any spirit, or a cup of hot chocolate or coffee. They are very dry after the second baking and store very well, for a long period of time. Bagged up, they make great presents, so what better gift could you give this Christmas? Having said all of that, they’re great eaten hot out of the oven after their initial bake (much more cookie-like), so if you can’t quite squeeze all of the slices onto the tray for their second bake, you’ve got an excuse to eat the surplus there and then And as for their keeping abilities, I’ve never known them to hang around for more than a couple of days! Next Post Christmas Cake – It’s never too late! Yum! What a perfect Christmas gift!